A friend of mine mentioned this magazine to me a couple weeks ago and I picked it up based on his recommendation. Am I glad I did! I had originally passed on picking this up, having seen it in several places. I hadn’t looked too closely at the cover, just figuring it was yet another gun magazine making a cursory effort to appeal to the prepper crowd. And given that Living Ready is something of a spin off from Gun Digest, that would make some sort of logical sense. The reality though is that is far from being the case. 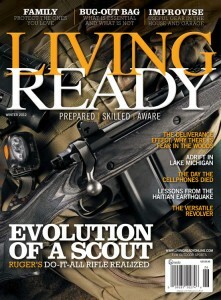 Living Ready Magazine is a welcome addition to the prepper world. It is well designed and thought out, with the entire issue’s focus on the magazine’s subtitle — Prepared Skilled Aware. Being the first issue, it isn’t surprising to me that a few of the articles are excerpts from existing books, rather than brand new material. Having been at least a little bit involved in the start up of a new magazine myself not too long ago, I know well the difficulty of lining up new content. However, these excerpts are great, very appropriate, and well written. The remaining articles are also well thought out and easy to follow. There is quite a range of information presented in Living Ready. Everything from choosing firewood to putting together a bug out bag is covered. I was particularly interested in the article on radios and emergency communication as I recognize this is one of the areas I need to improve myself. One thing I particularly liked was the ratio of content vs advertisements. A magazine lives on ad revenue, no doubt about it. That’s what pays the bills. Yet, the ads here are not as IN YOUR FACE as they are in some similar publications. My understanding is the plan is for Living Ready to come out four times a year. I can only hope the powers that be bump that up to every other month, if not monthly. Yes, it really is that good. I found my copy at a gas station, of all places, but I’ve seen it on just about every decent sized newsstand in my area. You can also purchase a digital copy here, though I do note a couple of the comments suggesting issues with reading the magazine on a Kindle Fire. I’ve no clue whether that problem has been fixed as of yet. Living Ready is highly recommended. Give them your support for their first issue. Thanks for sharing your honest and insightful review of the first issue of Living Ready—with your clear understanding of publishing a new magazine and how important advertising revenue is to getting mags to the store shelf. We’re hard at work on the first issue of 2013 which goes on sale in mid March. Every issue going forward will continue to address the full gamut of what it means to live ready, to survive and thrive no matter what the world throws us.